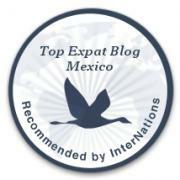 Favorite Things in Mazatlán | ¡VidaMaz! Fresh seafood, of course! Life here means waking up, getting Danny off to school, and walking or biking the malecón (oceanside promenade) with a cooler. We may decide to visit the pescaderos (fishermen) at their pangas (boats) in Playa Norte, or one of the two little pescaderías right across the street, to buy pargo (seabream), lenguado (sole), huachinango (snapper), or maybe sierra (saw fish) for a good ceviche. We can buy enough fish for two meals for US$3.50, or pay a bit more for swordfish or dorado, and significantly less for octopus (sometimes US$1 per kilo!) or squid. We might buy a kilo of fresh prawns for 40 pesos (US$4), or oysters from the ostioneros as they come to shore with their inner tubes and netting (US$4/dozen). We have some great conversation, beautiful views, shop for lunch, and exercise, all at an easy pace and before beginning our work day. The Green Man. Yes, he is one of my favorite things here in Mazatlán, along with dozens of other really cool and unique vehicles of all descriptions. The first time we saw him, he was also dressed up all in green and wearing a green helmet with horns, like a Jolly Green Giant version of a Viking. 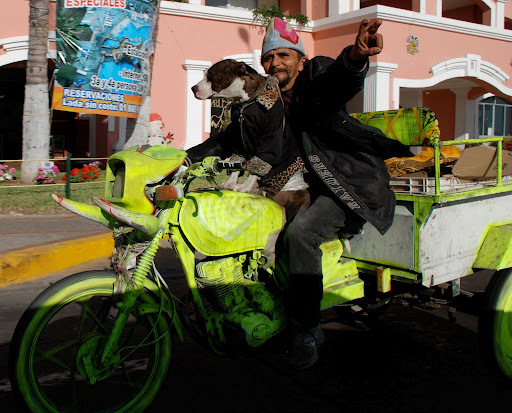 These days he’s added the cart to the back of his bike, and he always has his dog with him.